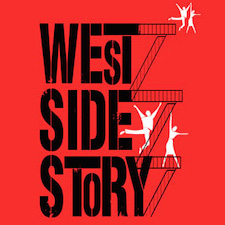 Inspired by the timeless story of Romeo and Juliet, West Side Story takes Shakespeare’s star-crossed lovers, and places them in the vibrant battleground of New York City’s West Side in the 1950s. In the midst of the deep-seated rivalry between the Puerto Rican gang, the Sharks, and the white gang, the Jets, Maria and Tony discover that ancient grudges are no match for true love. Their warring factions, however, refuse to back down, and the “rumbles”, romance, and resentment lead the bloody path to the lovers’ ultimate, tragic conclusion With soaring, sophisticated, and diverse melodies, energetic and athletic dance battles, and its remarkably salient social message, West Side Story remains one of American musical theatre’s most revolutionary and most loved treasures.